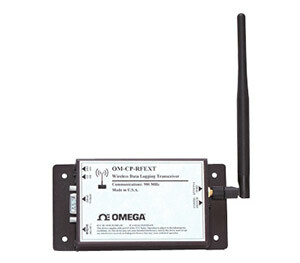 The OM-CP-RFEXT-KIT will allow any OM-CP-Series data logger to be remotely mounted up to 1 mile away from a computer. The system will consist of one RF Transceiver module mounted at the computer and one Transceiver module mounted remotely. An OM-CP data logger may be connected to the RF Transceiver module through the OM-CP-IFC101 cable. Once a data logger is connected, all communication between the computer and the logger will be transparent to the user. In other words, the logger will act as though it was connected directly to our OM-CP-IFC101 interface cable to a computer. The wireless link can be used to log data in real time at the host PC or periodically download data from the remote device. 참고: Both models include complete operator’s manual, PC interface cable and remote interface cable (connects to datalogger).